I have hunted most my life. My family, the Harts, the Massett's, and my brother Rick are all big hunters. I learned most by listening to the stories at camp told by Jim Massett, my uncles, and cousin Roy Hart... up in the Adirondacks. 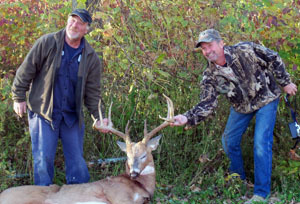 I have shot lots of average bucks hunting with Rick, but all with guns. I hunted over 20 years with my bow and have seen buck fights with little bucks gettin' their butts kicked by bigger bucks trying to get hot does, it would make you laugh. I got my two sons to love it like me. I have never shot a buck with my bow until opening day last year... Oct.16, 2010 in Lysander N.Y. The morning was windy and raining, but in the afternoon the rain stopped and wind settled. I grabbed my things and got to my stand about 2:30 on a small chunk of land my buddy "Shorty" lets my brother and I hunt. At about 4:00 I broke a couple branches in my shooting lane. Within fifteen minutes, I heard something behind me... there it was, 10 yards from my tree, rubbing his horns on the branchs cleaning his scrape with his hoof. My body trembled. He was huge! I reached for my bow while saying to myself, "Don't mess this up." I turned around, leaning around the tree, as he started walking away. As I drew my bow he stopped, looking into this field... I shot. He jumped and ran. I knew I hit him back farther than I wanted. I sat back and could not believe how big he was. I called Rick to tell him what happened he and my cousin Roy told me it is best to leave him till morning or I may kick him up. It would be a sleepless night, but the right thing to do. My brother and I returned at first light. We found the bloodtrail and tracked him down. He went less than 100 yards. I come from a family of good hunters. I am a persistant hunter and I tell my sons they have to be out there rain or snow... it will pay off some day. 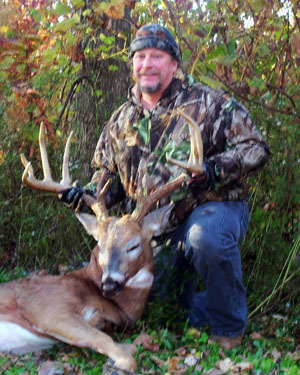 Bob's Buck gross scored 177 4/8 and netted 167 3/8 making it eligible for entry in P&Y, B&C and the New York State Big Buck Club record books.